The 160 m2 comfortable house has 4 bedrooms with 4 double beds, large living area with dining room, 2 bathrooms, kitchen, balcony, large garden and parking. 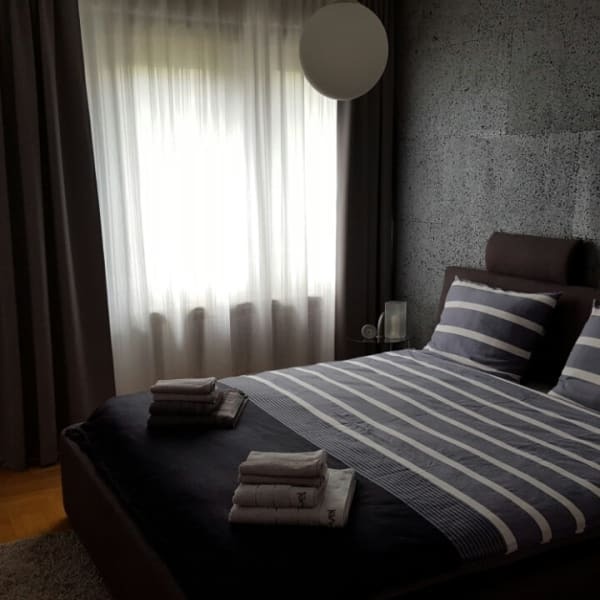 The house is located in quiet, residental area, only 10 minutes to the city centar by a ******** comfortable and fully equipped house ideal for parents with children, couples and groups. Maximum occupancy is eight persons. It is possible to bring pets to be placed in the space reserved for them and which are located in the courtyard. The house is situated in a quiet street with 24 hour security and only ten minutes drive from the city center. On the ground floor is large living area with dining room, kitchen, bedroom, bathroom and balcony with exit to the nice green garden. On the first floor is three large bedrooms with double beds, bathroom and balcony. If you stay longer than five days, bed linen and towels are changed on the fifth day, or earlier if necessary. The same means and the cleaning of the house. There is a possibility of organizing breakfast in accordance with the wishes of guests. Total price of rent per day is for the maximum number of guests. In the case of less guests price can be adjusted. Also, for every stay longer than 7 days will be charged a discount. Each guest will get welcome drink in a local cafe bar, a city map and a booklet with important phone numbers and house rules.